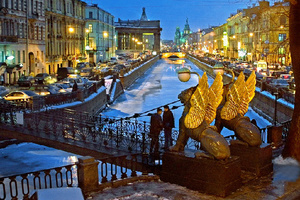 For your visit to St. Petersburg choose the most comprehensive small group tour of St. Petersburg on the market! Upon arrival you will be met at the airport and transferred to the hotel. Hotel check-in and free time to relax and get some rest after international flight. Your tour includes a visit to the Faberge Museum at the Shuvalov Palace with the biggest collection of Faberge works including famous Easter eggs. We begin our day with the morning tour of the Hermitage Art Museum, one of Russia’s main treasures. Occupying six stunning buildings along the River Neva, the Hermitage is the second largest art museum in the world (Louve in Paris is the first) founded in 1764 . The museum has a wide range of art on display (over three million pieces!) - from prehistoric collections to modern art. French Impressionist and modern art are displayed in the General Staff Building and features Renoir, Mattisse, Dega, Picasso, Malevich, Petrocelli, Kandinsky, Giacomo Manzù, Giorgio Morandi and Rockwell Kent. 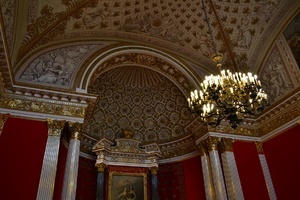 Today you will visit both Winter Palace and General Staff Buiilding expositions! After breakfast you will visit Peterhof, located on the southern shores of the Finnish Gulf 14 miles away from St. Petersburg. 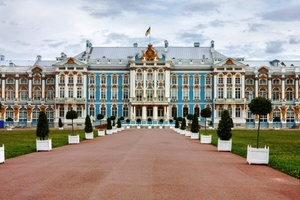 Often referred to as "the Russian Versaille," it is one of St. Petersburg's most famous sightseeing attractions. Inspired by Versailles, Peter the Great wanted to build an imperial palace in the suburbs. As a result, the Monplaisir Palace and the Grand Palace were erected. The Grand Palace with its lavish interiors, gilded decorations, mirrors, and paintings dominate the estate. The Park outside the Grand Palace is a splendid kingdom of 144 unique fountains, all operating by a combination of naturally generated water pressure and magic. The outwardly-modest Monplaisir Palace which Peter I preferred to the Grand Palace has a nice sea view and several interesting rooms, such as the State Hall where Peter would force his guests to drink huge quantities of wine until they passed out. 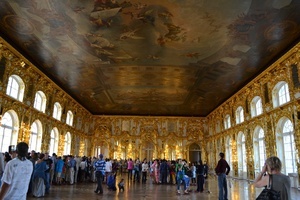 The nearby Hermitage Pavilion, which also has nice views and artwork, is a two-story dining room where guests sitting on the upper floor ate and drank in peace, occasionally lowering the table to the ground floor where servants refilled wine glasses, replaced dirty plates, and spat in the beef stroganoff. After a short break for lunch, we will drive to Kronstadt, an old town on the Gulf of Finland founded by Peter the Great as a naval base. Traditionally, the seat of the Russian admiralty and the base of the Russian Baltic Fleet were located in Kronstadt guarding the approaches to Saint Petersburg. The historic centre of the city and its fortifications are part of the World Heritage Site. We will visit the absolutely stunning Naval Cathedral of St. Nicholas built in 1903–1913 as the main church of the Russian Navy and dedicated to all fallen seamen. Return to St. Petersburg for dinner at a local restaurant and overnight. 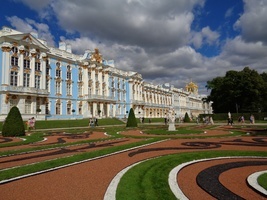 After breakfast we will begin an all day tour to Pushkin located 18-20 miles from St. Petersburg. Pushkin's original name is Tsarskoye Selo (Tsar's Village). It was renamed in 1937 after Russia 's famous poet Alexander Pushkin who used to study here. 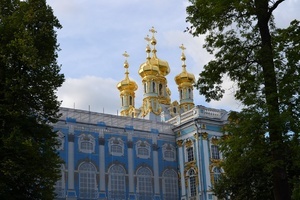 Its palaces and parks were created under Empresses Elizabeth and Catherine the Great between 1744 and 1796. 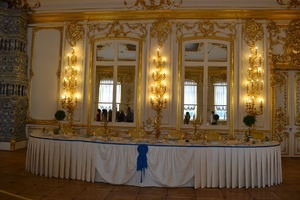 The main landmark is the Catherine Palace designed by Rastrelli and the famous Amber Room inside the Palace. On our way back to St. Petersburg we will stop by an impressive memorial dedicated to the struggle and hardship of the residents living in the city during WWII. The Monument to the Heroic Defenders of Leningrad and St. Petersburg Siege Memorial was built to be the main focal point of Ploshchad Pobedy (Victory Square) in the early 1970s. A special bank account was opened to take donations and many people took part in the construction including volunteers and famous artists of the Soviet Union such as Mikhail Anikushin, Sergey Speransky, and Valentin Kamensky, all of whom participated in the defense of Leningrad. Our tour of St. Petersburg continues today with three important visits: Peter and Paul Fortress, The Church of the Savior on Spilled Blood and St. Isaac Cathedral. Our next visit is to one of the world’s largest and most splendid St. Isaac Cathedral. Beautifully decorated inside with marble of 13 colors, malachite, lapis-lazuli, paintings, mosaics, and stained glass made by the most famous Russian artists, it can accommodate about 10,000 people at a time. The Cathedral was designed by then unknown architect Auguste de Montferrand and opened in 1858. 12-hour tour to Velikij Novgorod including Kremlin, St Sophia cathedral, Yaroslav Court, Yurjev Monastery, Museum of Wooden art and lunch. GROUP SIZE: max 15 people, all departures are guaranted for min. 2 people. Due to public transport reguations around te Red Square and Kremlin in Moscow, Day 2 of the tour requires a lot of walking, approximately 5 hours!